A good 200 years ago French craftsmen to the name of the Martin brothers came up with a varnish to fake the Chinese and Japanese lackerware to make it available to the well to do. Their ware took Europe by storm and most household had to have a set of vases or a carriage clock in “Vernis Martin”. A good number of years ago I saw a carriage clock in delicate shades of turquoise blue with lovely soft hand painted roses in a Lyon (France) Decorative Arts Museum. It was a “Vernis Martin” clock, I can’t remember the museum but I can still remember the clock vividly. It had this elegance of timeless pieces, it had aged beautifully and the varnish had … 200 years later taken some lovely small cracks which we aim to copy nowadays with all sort of concoctions. Off course I have spent the following 30 years trying to reproduce this elegance in my ware. 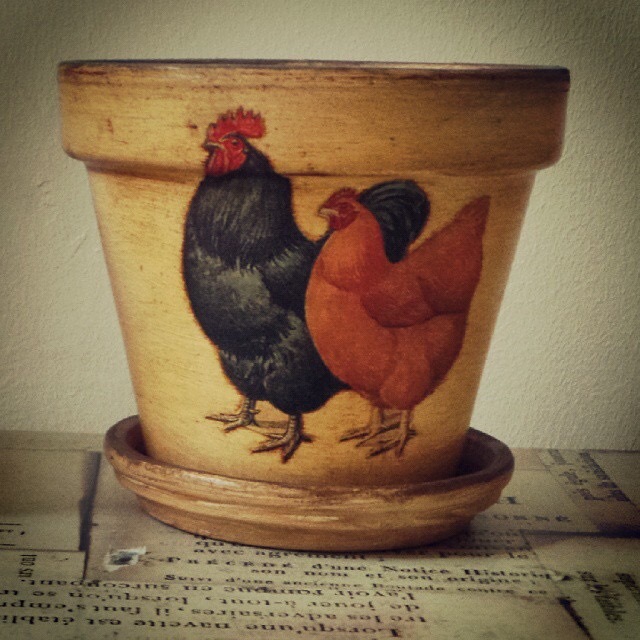 I have decorated a good number of items over the years, all shapes and sizes, all colours with and without prints but my favourite is still the humble planter pot. A few thousands of pots have gone through my workshop and I hope they are adorning the home of those who have purchased them. I have this vision of pots seating on window ledges with delicate plants ageing beautifully. Every so often I meet a past customer who still treasures their. Sometimes I come across a course goer who confirms pot making is addictive and after joining one of my classes they made pots for months… showering the whole of their families with those humble pots decorated in all sorts of way. I even meet last week end a past student of The Glasgow School of Arts, now the successful painter Elaine Johnston who antiqued pots for me during her students years…. Elaine and I laughed at the memories of pre-Christmas rush and piece work. For my pots I have always used French prints, farmyard designs, classical borders, delicate botanical plants and flowers… hand cut (another piece work joy) they were delicately glued to a painted pot and then an antique finish is applied over the top. Finally it is varnished and protected to insure the finished object is enjoyed for years to come. Those pots have found their way to some of the most prestigious gifts shops around Europe and beyond… from the National Trust of Scotland garden shops to the shelves of Harrods via Paris outlets and even the Metropolitan Museum of Arts in NY one year. This week I have extracted from my workshop 18 unique pots in a variety of styles and I have given them to Glasgow based Chocolatier Stacey Hannah (alias Miss Sugar Wings) to fill up with her hand made chocolates, her hot chocolate mix and her hand made marshmallows. She will sell them over the Christmas Period in Glasgow to lucky people who will get the best chocolates and other delicacies and a delightful pot to keep for years to come (I mean the pot not the chocolates… if I was them I would scoff the chocolates on my way back they are that good…). Stacey is a proper Chocolatier you know… she was trained by a French Man from Meert in Lille and her chocolates have the sparkle of French chocolates they are truly amazing… Have you ever read the novel “Chocolat” ? Well when I read the pages about the chocolate making I can just imagine Stacey using some of her magic to produce those little miracles … you only bite in them slowly and savour every little bit. She combines the best coco to delicate flavours. Her battle name is “Miss SugarWings” and she will be at the Glasgow – St Enoch Place Christmas market until Christmas. Why don’t you pay her a visit and treat yourself to one of my pots with her delicious concoction in it. What a treat… it does not have to be for Christmas but it could ! Previous Previous post: Ault Wharrie ! A very enjoyable job indeed ! Team work is essential for a great achievement !